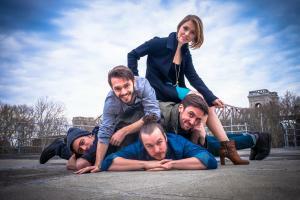 Beecher’s Fault creates music that is a catchy hybrid of folk rock and synth pop. The quintet lead by founding members Ken Lamken and Ben Taylor has been said to give live performances that produce a “wall of sound” complemented by “raw, honest lyrics” and “pristine vocal harmonies”. Max Maples (drums), Lauren Hunt (backing vocals) and Serge Ruccolo (bass) complete the group from one of New Yorks hottest neighborhoods: Astoria, Queens.